At the end of October 1912 Johanna Raphael-Jongkindt sent Diepenbrock van Lerberghe’s poem Berceuse. It lead to the creation of a fine song in two versions (see RC 111 and 112). Expecting that this Belgian poet (1861-1907) would be able to provide him with other inspiring verses, Diepenbrock bought himself the collection La chanson d’Ève (The Song of Eve) on 8 November. He must have been moved by De mon mystérieux voyage (About My Mysterious Voyage), a love poem full of tenderness. 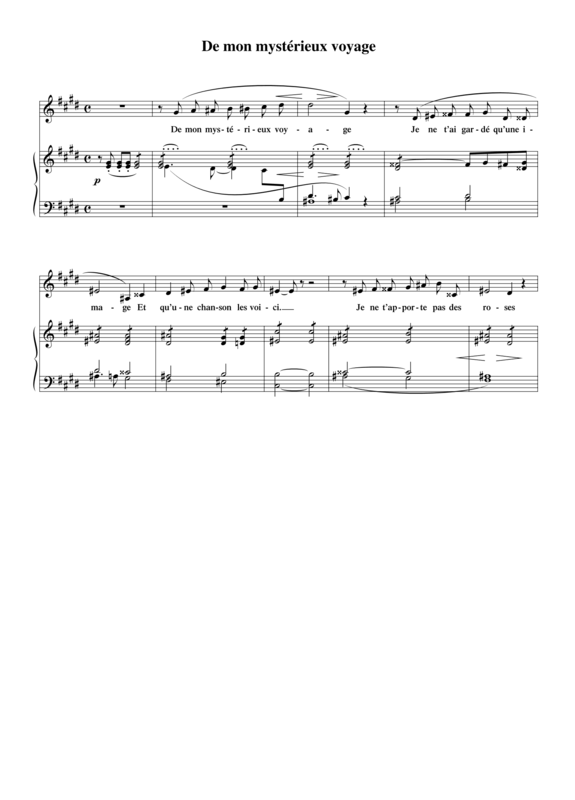 On 14 November he wrote the vocal melody for the first line. The following day he extended this two-measure setup into a setting of four lines. However, the composition never progressed beyond the nine-measure fragment given here. The poem is not mentioned anywhere in Diepenbrock’s correspondence. Elles aiment à vivre aussi. Dans toutes les ombres du soir. De la clarté dans le silence. Ma main légère, et mon baiser.